UBA, South Sudan (Morning Star News) – A court in Omdurman, Sudan on Wednesday (April 11) charged four Christians who defended church property from a takeover by a Muslim business interest, sources said. Azhari Tumbara, Muna Matta, George Adam and Kudi Abderhman last year tried to keep authorities from seizing Sudan Presbyterian Evangelical Church (SPEC) property in Khartoum. Judge Adam Babiker charged the Christians with causing physical harm to police and supporters of a Muslim businessman who tried to take control of church school property in April 2017, Yahia Abdelrahim Nalu, SPEC moderator, told Morning Star News. Pastor Nalu, Pastor Idriss Kartina, Pastor Zachariah Ismael, elder Bolus Tutu and Salim Hassan were acquitted. Tia was one of 26 church leaders who appeared in court over a two-seek span in the case. Seven church leaders were ordered to pay fines of 2,500 Sudanese pounds (US$137) each, and 19 were freed for lack of evidence, according to Pastor Nalu. 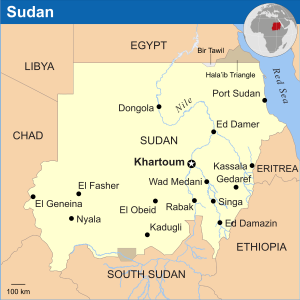 Two pastors—Dawoud Fadul, SPEC moderator, and Pastor Kartina—were also fined 2,500 Sudanese pounds each. Church elders Adam George, Bolus Tutu and one identified only as Azhari were also fined, along with school director Ustaz Dauod Musa Namnam. On Aug. 15, 2017, police raided Pastor Nalu’s home and another belonging to SPEC leader. They evicted the families of Pastor Nalu and Sidiq Abdalla, a SPEC pastor who has two children, ages 8 and 10. Pastor Nalu has a 1-year-old boy.